First released in the Nervy Neons collection. Also released in the Wow Factor collection and repromoted in the 2008 Ink collection and in 2015 for Summer Favorites.. 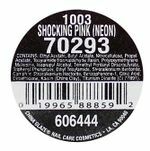 Shocking Pink was released as a gel polish during the initial launch of Geláze in 2014. Number 606292. This page was last edited on 19 September 2018, at 11:07.